I tend to have a systematic, organized, collector type personality. So when I really got hooked on rock climbing, I was pleased to find there were all kinds of things to collect. Gear… oh how that shiny new gear can get the blood flowing. A new set of cam’s or nuts for your rack. Don’t get me started on shoes. I discovered my favorite shoes (to date) and in order to preserve them, got a “messing around” pair too, for my training and warm-ups. Holds for my homewall… yeah, I collect those too. Ticks… and I don’t mean the blood sucking parasites. I mean a list of dream ascents. And the ability to check them off one at a time. Climbing Partners… I’ve come to realize that one can never truly have enough climbing partners. For the shear fact that we all have crazy schedules, it is optimal to have lots of options when you need them. Plus, climbing is the ultimate social activity. 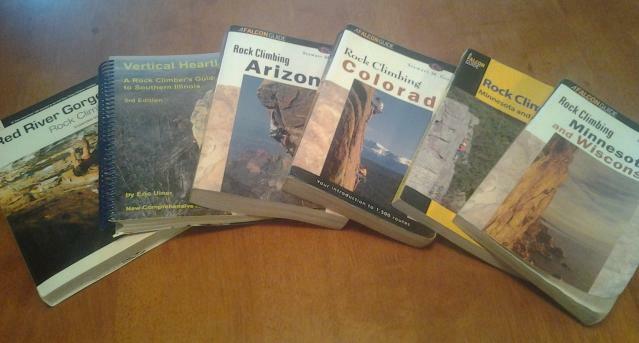 So when I got serious about climbing (which didn’t take long), knowing that it would bring me to many great locations, I decided that I would purchase the guidebook for that location. Even if I was only going to be there one time, I wanted the guidebook for the memories… and for the collection of course. I haven’t been to as many climbing locations as I would have liked, but I would not trade any of those experiences for another. And there’s a bright side, there’s plenty of time left to add to the collection. Naturally, first game Minnesota & Wisconsin. Then, several summers during my college years, I climbed in Colorado. My climbing trip to Arizona was a spring break adventure. As a birthday gift a few years back, my wife conspired with my former college roommate/climbing buddy for a stellar surprise trip to Southern Illinois (Jackson Falls). And then there was the amazing trip to the Red River Gorge. ~ And many more fantastic locations across the world (Spain, France, Australia, South Africa). There is plenty of room on the bookshelf… and no shortage of desire to Collect. What does your guidebook collection look like? Share in the comments your recommendations for the best guidebooks at your favorite locations. EDITED to Add: Two new guidebooks added to the collection. 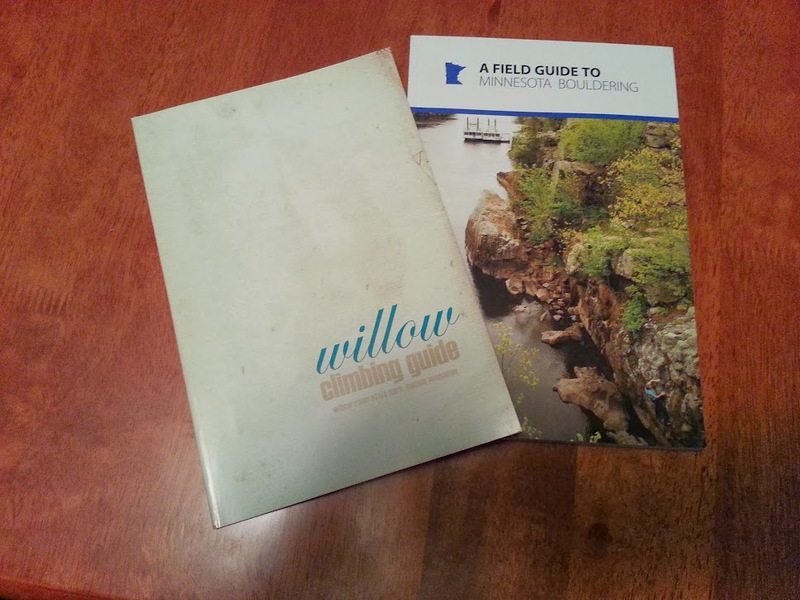 Brand new, hot off the presses is the “Field Guide to Minnesota Bouldering” and “Willow Climbing Guide”. The Minnesota Bouldering guidebook was co-written by Nic Oklobizja, Richard Cargill, Chris Craft, and Jon Marek. It has been long awaited and much needed in this area. It comes with full color photos and a rich history for each area. The Willow River guidebook, while short and sweet, also comes with a rich history of the climbing at Willow River as well as full color photos of the many link-ups in this very steep sport climbing area. Husband, Father, Rock Climber, Entrepreneur, and much more. Posted on August 12, 2013, in Media: Books & Videos, Trips & Outings and tagged climbing, collection, guidebook, rock climbing, trip. Bookmark the permalink. 12 Comments. For years I purchased every new guidebook to the Gunks that came out. I still haven’t made it there to climb. We’ll both have to change that. I’ll polish of my trad leading rust. It looks amazing!!! I prefer the second edition to the third for it’s size alone, but the third has additional material that’s kind of nice. And of course, no shelf is complete without Freedom of the Hills, and John Long’s Climbing Anchors. These are my two favorite books- the new Squish guide is great, much better than the old Select guide. The Handren Guide is one of the better guidebooks out there- it pairs well with Southern Nevada Bouldering by Tom Moulin if you want the complete Vegas sandstone collection. The two volume guide to red river gorge is one of the nicest and most informative ive read.